Gift Card Holders? I know I do! 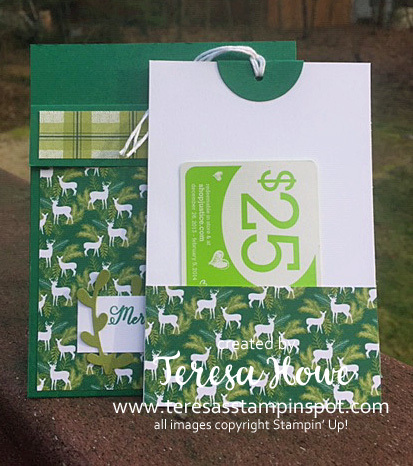 So today, I have two different versions of Gift Card Holders for you! 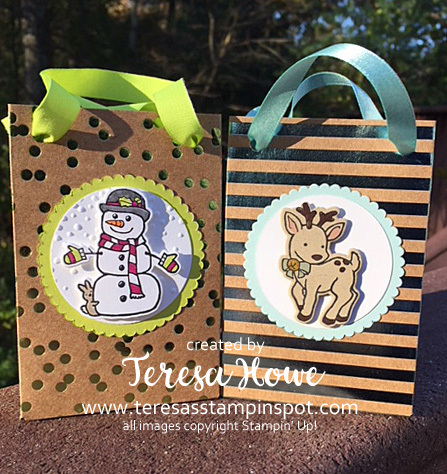 Both of these holders feature Under The Mistletoe Designer Series Paper which you will find in the Annual Catalog. 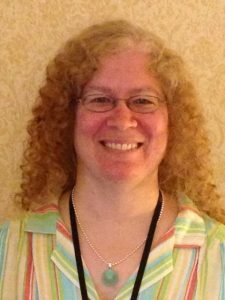 Base: 5″ x 7 3/4″ – Score at 2 1/2″ and 6″ on the 7 3/4″ side. The video above also shows how to make this pocket holder. I hope you enjoyed today’s projects! 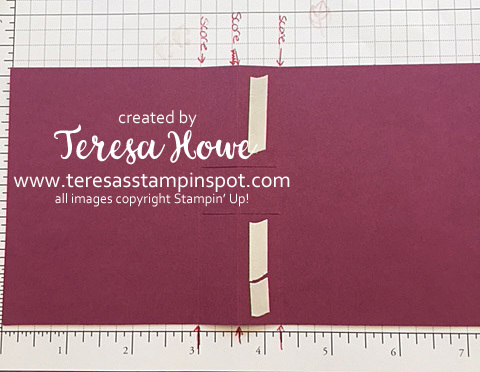 You’ll find all supplies in my on-line store – just click on a product below to get there! Hi! 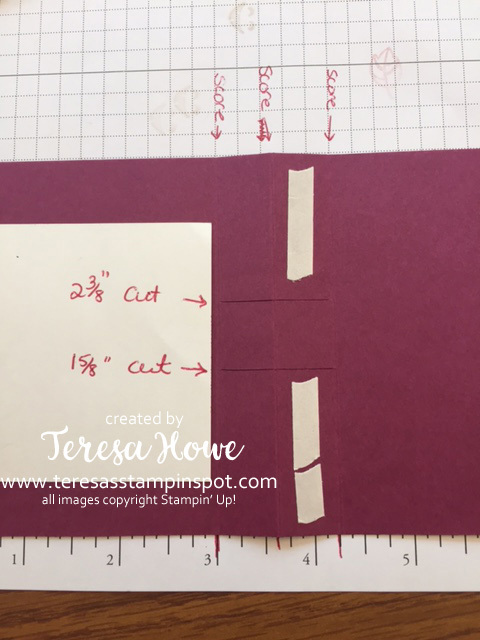 Yes, I know, it is usually Christmas in July – but Stampin’ Up! 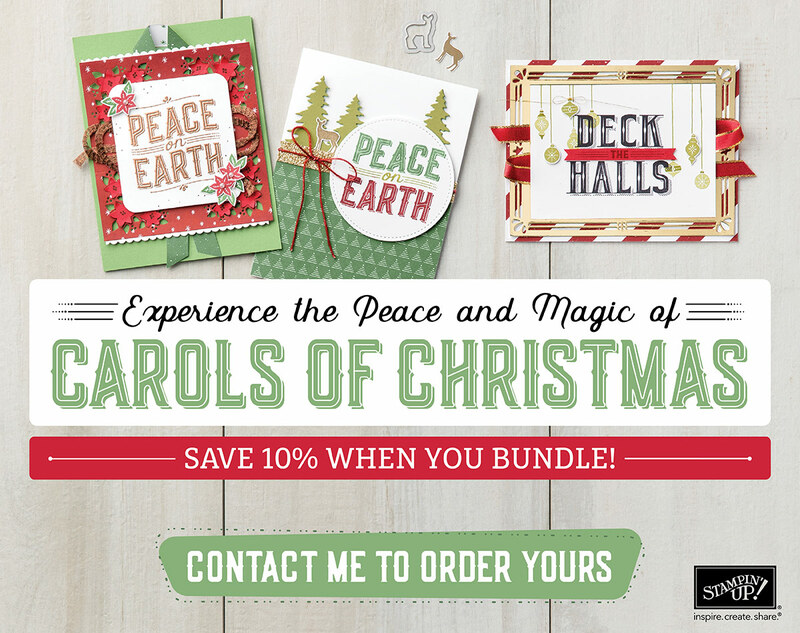 is giving YOU the opportunity to purchase the Carols of Christmas bundle this month – and I wanted to give it a little love to help entice you! I made this shaker ornament using the coordinating Card Front Builder dies along with the Layering Circle and Stitched Shapes framelits. I just love that little deer!! 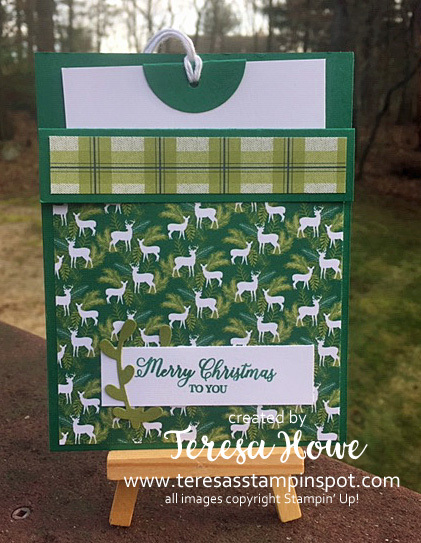 The trees and deer were die cut using the Card Front Builder framelits. The remainder of the ornament uses the Circle and Coordinating Stitched Circle framelits. 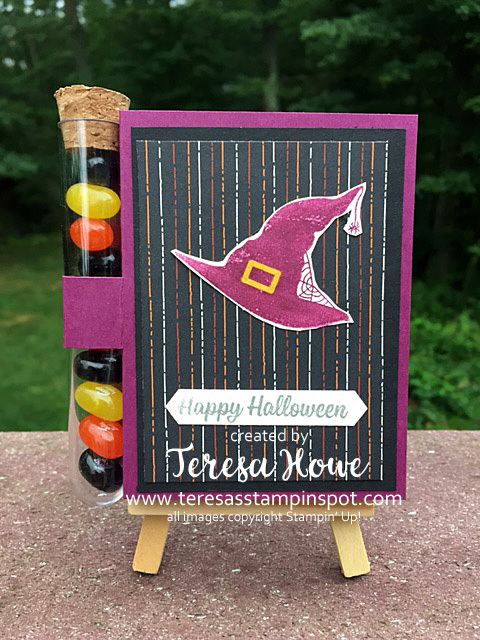 I did use the retired Mica Flakes from last year’s Holiday catalog – but GOOD NEWS!! – they are still available on the Clearance Rack!! You will find them here. If you are looking to get started on your Christmas cards or little gifts, I highly recommend ordering your bundle today!! You can order your bundle here. 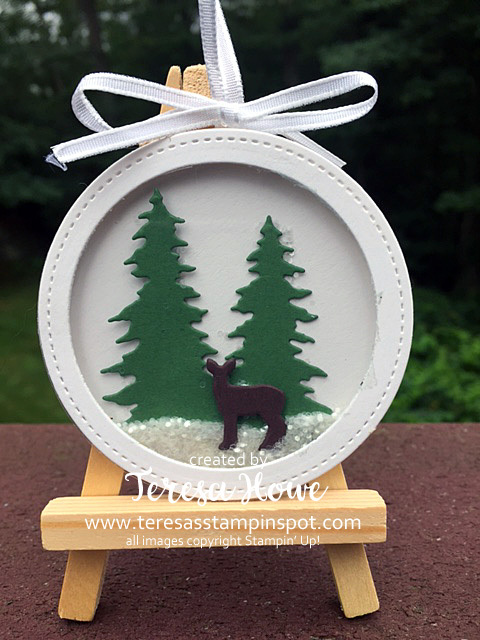 To make the ornament, you will need the largest Stitched Frame Circle, matching Layering Circle and the next size down Circle. Center the smaller of the two circles inside the Stitched Frame Circle and run both through the Big Shot together. This will give you your outside frame. Die cut the larger Layering Circle from solid Cardstock for your background as well as from a Window Sheet for your front. Attach the Window Sheet to the Stitched Frame circle. Die cut your trees from Garden Green card stock and your deer from Chocolate Chip. Adhere the trees to the background circle with Snail and use a mini dimensional to adhere the deer. Apply Foam Strip along the backside of the Stitched Frame circle leaving no gaps so the mica flakes do not fall out. Remove the backing from 2/3rds of the foam strip leaving the top 1/3 covered so that you can add your Mica flakes. After adding the flakes, make a loop/hangar using Whisper White 1/8″ ribbon and attach between the foam strip and the background circle when sealing the top of the ornament. Make a bow and attach to the top with a glue dot. 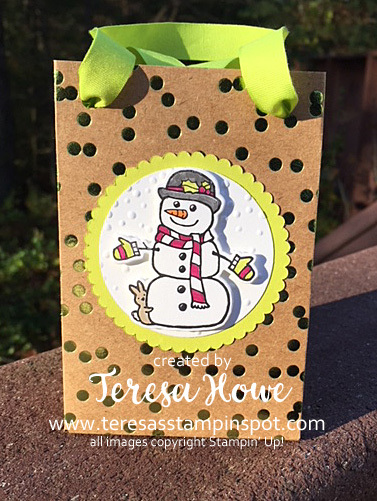 No stamping involved and such a cute ornament!! Has this convinced you you NEED this bundle? 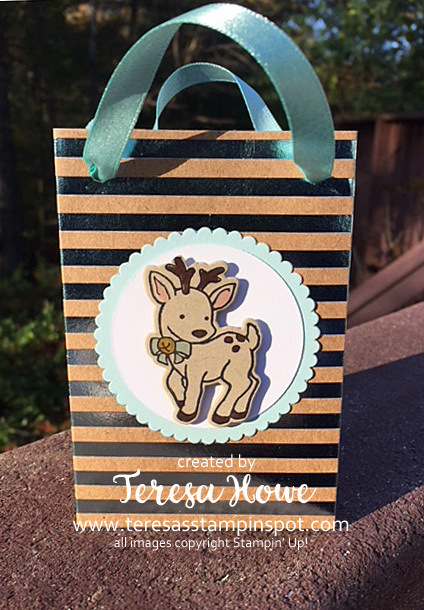 You can purchase all supplies to make this ornament in my on-line store here. Use Hostess Code: AR2U2HRB when ordering less than $150 and I’ll send you a FREE gift!